We are having the rule: one thread per broker if free. 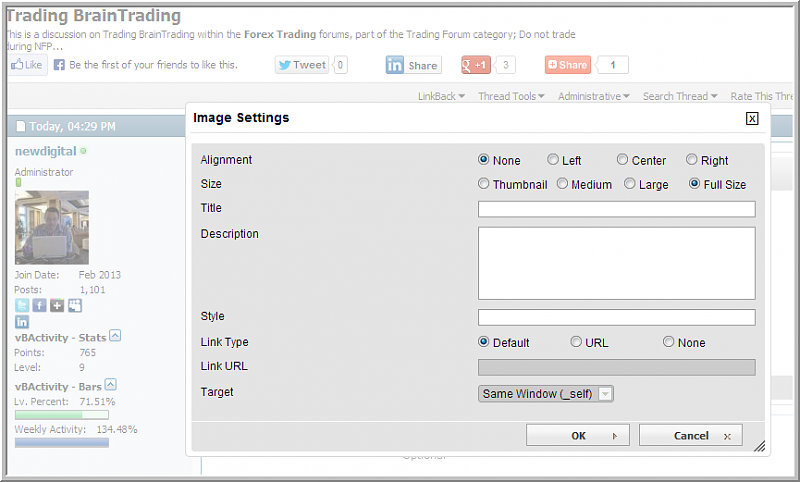 Could you enable images in the posts to be viewed in an enlarged format, when necessary. Some images are small and details cannot be seen at all. I see images as a big one. Can you provide the link with small image? Besides, images can be uploaded with external (your) links (we are allowing external links). I think - this forum should have as less limitation as possible concerning it. And we will ahve the Gallery soon - for Fine Arts and for Forex too. 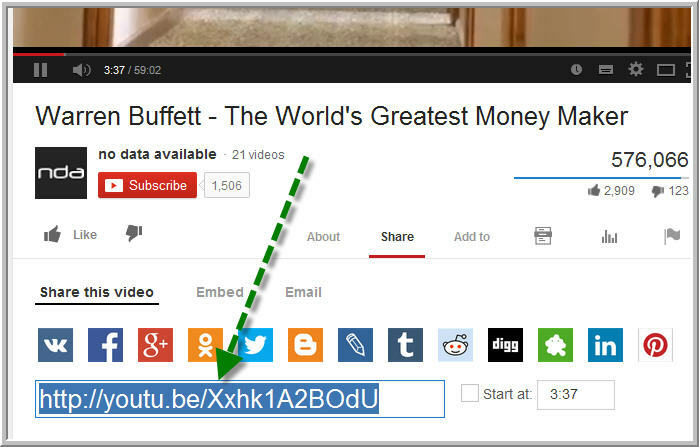 How to post videos to the forum. We are having some addon which allows users to simply paste URLs into their message without having to use the video bbcode or video popup box. I mean - you can just post url of video inside your post in any place, and it will be converted to the video automaticallt - no need to go to any menue/options to edit the post to press "Insert Video". Please guys - upload the avatars, ok? go to the Settings (on the top of every page) - Edit Avatar ... and upload avatar (your custom, our custom, or any). It's good to see you starting a new forum - let's all use our talents and skills to make this a great place for the experienced trader and the newbie. 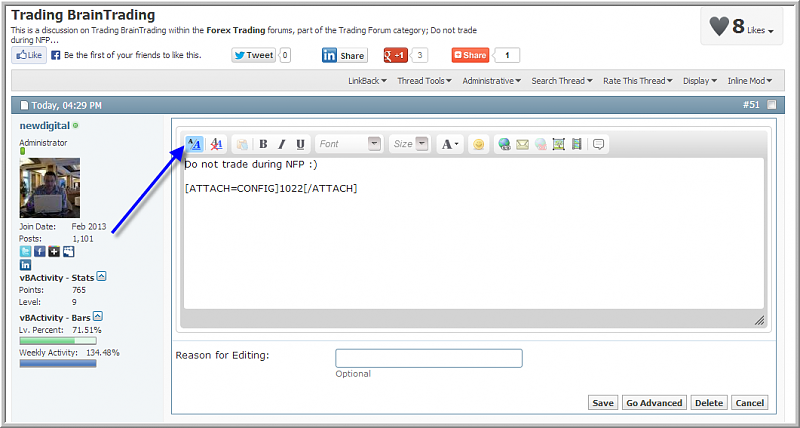 There are two suggestions that I think would make this forum user friendly - first is a forum related "how to" section. 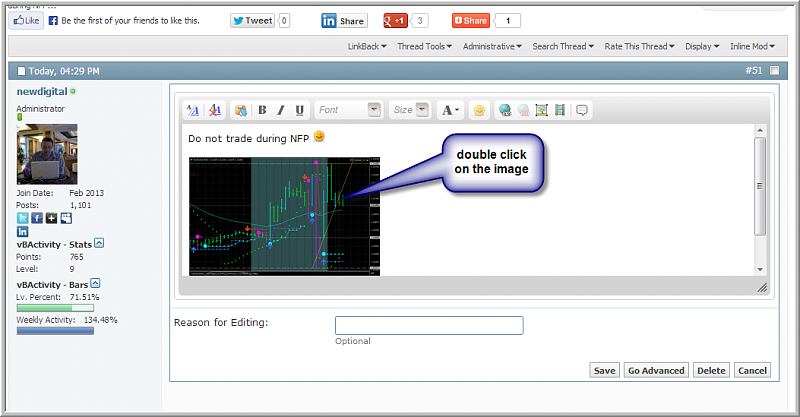 Here we can teach members a default method to share things like charts, word docs, links, pdf's ect. We could also have quick videos to show people how to use the features of the different platforms - loading indicators, scripts, EA's - shortcuts for managing trades ect. The second is to have a guest speaker once a month to share their method, ideas, tip and tricks. We can also open the door for sellers to post their wares here ONLY if they would be willing to do a simple live Q+A so members could get a sense of who the vendor is before buying. Good luck with everything and please let me know if i can be of any help is getting things off the ground. admin, advice, assist, moderator, suggestion, where is administration?